Last edited by Coyotes-R-Us; 07-09-2017 at 06:01 PM. I have not been slacking. Making a bracket on the back of the VW motor around the flywheel. Making a starter bracket to mount the original starter. My buddy , my welder , Is off playing on the other side of the divide. We will be busy when he gets back. I'll get up some pics. I made a VW motor mount and starter mount. So the Motor is officially attached to the Hull. At least the back of the motor. You're moving through uncharted territory there with this build it makes it tough to just do it everything needs some thought...I'm assuming that you're eventually taking the shields off the engine ??? 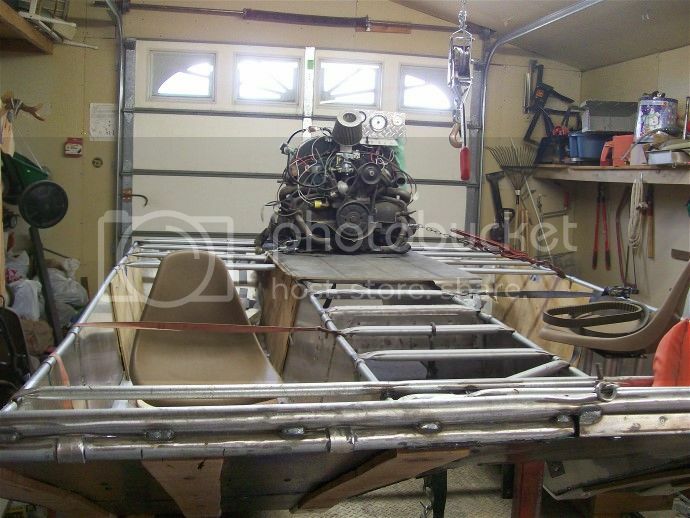 We built a VW DD airboat years ago..We took the bellhousing off a transaxle,fastened it to the engine stand behind the operators seat then mounted the bare VW engine to that...It was nice and clean looking..But in your case it wouldn't be possible to mount it like that .. Yes, driving off the back is definitely the hard way to go. We are planning to leave the tin on , to keep it warm in the winter/fall. 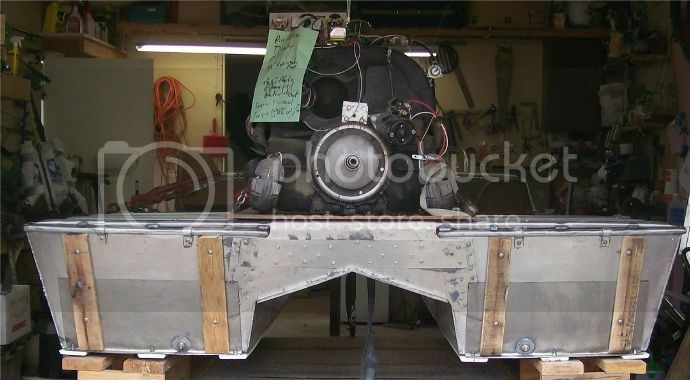 Your getting closer, sometimes it seems that nothing gets done real quick, when you are doing a custom build like yours, it has been great to always see the progress. 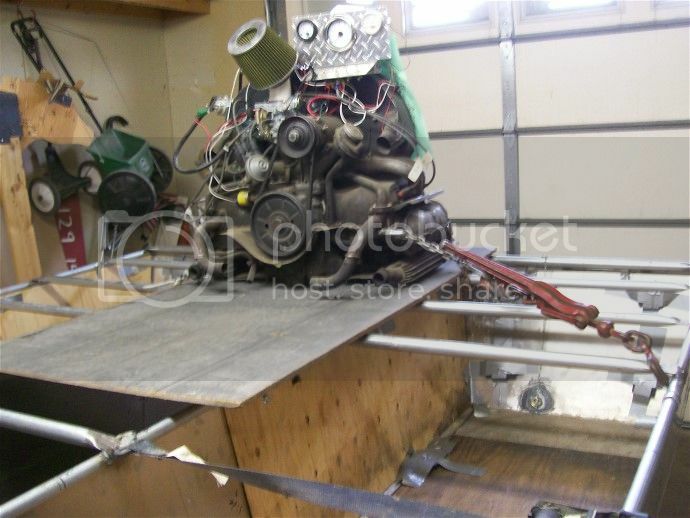 Here's my memories of our VW engine build from years ago...We did a direct drive using an old bellhousing from a VW beetle and mounted it behind the seat...It had a cylinder head temperature gauge and a wood prop...In our crazyness we actually use a modified V hull !! Believe it or not this thing would spin on a dime compared to the standard jon boat hull.. Anyhow we ran everywhere up and down this river with it and the only limiting factor was the engine temperature..
Did you run off the front or Back . Winter and keep them hot to run good. I'm open to ALL thoughts, PLEASE . Here is a thought on the cooling tin and air to the Prop. Do you think It will stop more then a person sitting in font of the prop? Crankshaft. We will be sitting in the cats to the side. 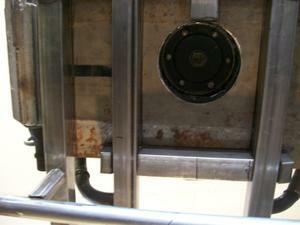 I do have to make something, to duct in the air for the cooling Fan. I'm afraid the prop will steal all the air at the back of the motor. The carb Is on the front, the prop should not bother it, correct? Front Motor mount and attitude adjuster. Last edited by Coyotes-R-Us; 09-12-2017 at 01:41 PM. Cool. I got the primary clutch and carrier bearing on and will do a test hopefully this week. I had to reposition the starter a bit to let it turn . Looks better. I'm still not for certain the 1600cc will turn the clutch fast enough to make it engage and change the ratio on the drive. It should. Today I did a Major test . A+!!!!! 1971 VW bug 1600cc undetermined mileage motor. This set in a shed for maybe 30 years. I Got a new carb at amazon ( still factory settings ), New coil, plugs wires points and condenser. I set the valves and point with a feeler gauge ,remember them ?a year ago I had it running on the ground for like 5 minutes for the first test of the clutch adaptor that I had made. It failed in moments. I redesigned and had it fabbed up again, This time with a carrier bearing and a shaft that went in to the piolet bearing in the crank. I Have not ran it since. 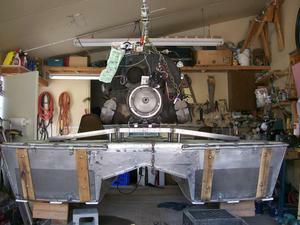 I built the hull made the motor mounts and finally mounted it on the boat. Made a mount for the carrier bearing re did the starter to fit. It is About a year later. Today I needed to start it up and see if my primary clutch off the 1969 Johnson snowmobile would even work. Dang! I put the fuel line in to a gas can and hit the starter. A dozen turns and she came to life. I have not put a timing light on it yet but it ran very smooth from, 800 rpm (Idle) after the electric choke came all the way off , to 5000 rpm ( as fast as I wanted to turn it unloaded). As stated in the information I could find on the clutch It engaged at 1700rpm and at 3100 rpm was fully moved in for the reduction change. Everything sounded smooth and solid. I ran it for a half hour or so at 2500 rpm. I still have to do some work on my temp and oil psi gauges apparently, but the oil on the dip stick was still cool to the touch. NICE! 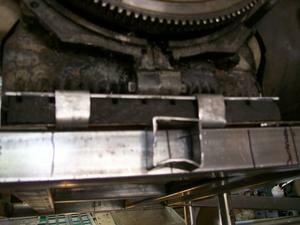 Next to mount the secondary clutch, and see if that part works as expected !! !